Your first question in the protocol is “Look at three problems on the board. Predict all of the mistakes that students might make.” I love this question. But I feel lingering guilt about how mathmistakes.org usually responds to this sort of question with a single example of student work. This has felt problematic in some of the conversations that I’ve had surrounding student work, because someone might be entirely right in their predictions in a way that isn’t affirmed by the chosen work. I worry that this feeling of “gotcha” sometimes kills discussion around student work since the initial predictions aren’t entirely engaged. I ended up using a class set of fraction-comparison work for Justin’s class. My experience cemented my opinion: if you want to talk about teaching or student thinking, it’s gotta be the class set. Why? Reason #1: You can’t be right or wrong with a prediction about one piece of student work. This is what I mentioned in my email to Justin, but I want to expand on it here. A great way to learn something is to make a prediction, and then check it against reality. But knowledge about student thinking is most powerful either in the aggregate or in the very specific. Meaning, to know something about student thinking is either to know something about how kids, in the aggregate, often think about something, or it’s knowledge about how this kid, right here thinks about it. It feels unfair to me to ask — as I have in the past — for people to invest themselves with a prediction that I can’t honor with a realistic response. Using a class set better respects other people’s predictions. Reason #2: You can’t really make connections and form generalizations about student thinking from one example of student work. When I worked with Justin’s students, I saw them making connections across different students. They noticed the prevalence of the area model in the student work, and that led to interesting observations, connections and questions on their part. Wouldn’t have happened if I just showed them the craziest one. Reason #3: Math Mistakes discussions sometimes devolve into “Well this kid needs one-on-one tutoring/special attention/I would pull her aside and ask…” The class context nudges us away from that. Look back on the comments from the first few years of this site, and you’ll see this line appearing over and over again. This imagines a context where you’ve got one student having a hard time, while the class as a whole mostly gets the math. This allows participants in a math mistakes discussion to shift the responsibility onto the individual student. That’s a fine context to imagine, but offering a class set of math mistakes offers a much richer context for conversation. Here is a class, in the middle of learning something. On the whole, they know some things and struggle with others. What are those things? What could we do next? Reason #4: It’s more authentic to the actual work of teaching. Finally, the class set more closely resembles the actual work of teaching, so participants get to practice an aspect of that actual work. We can sort and categorize student work. We can talk about groups of students, and develop language to describe different sorts of students and different sorts of struggles. I haven’t posted very many class sets on this site, though I’d like to do more. Feel free to continue submitting individual pieces of student work, but you’ll get a special high five if you send me a set of a class’ work ready to post. Your finest complex number mistakes, please! Help, if you don’t mind! I’d like to flesh out our collection of complex numbers mistakes. If you’re teaching this topic in the next few months, could you send me some pictures of mistakes? I’m looking for all sorts of mistakes — either common or uncommon errors. In the meantime, would you take a second and comment about a complex numbers mistake that you’re used to seeing from your students? Going 4325 mph, or how do you help kids check their problems for reasonableness? Integrating by parts, and a reflection on working through unfamiliar subject areas through mistakes. A fascinating fraction addition mistake. So are fractions and negative numbers. Thanks for all the great mistakes and comments lately, guys. Keep up the great work! Hey everybody! It’s so nice of you to visit here. … a mini-essay I wrote about some 3rd Grade Exponent mistakes. … a student who thinks that ln(5)-ln(4)=ln. 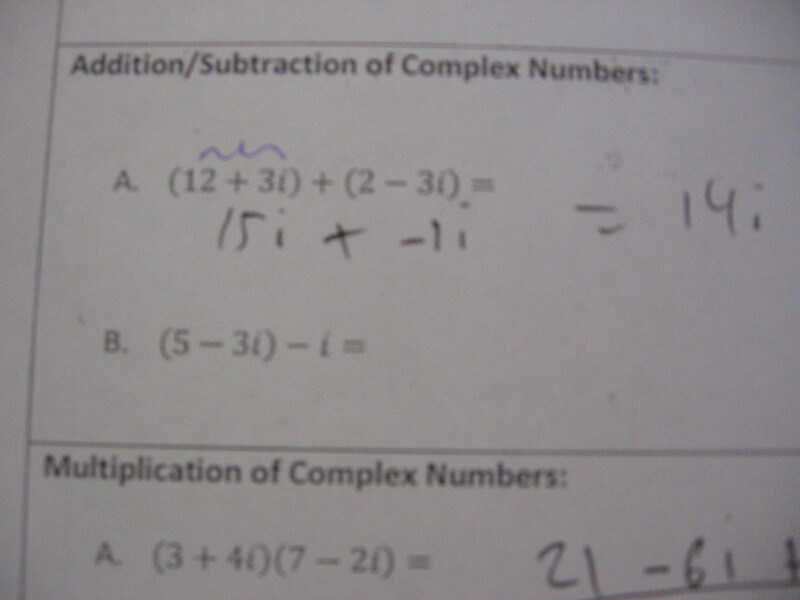 … some very non-standard fraction notation that my 4th Graders started using. … all of the answers my kids gave to Andrew Stadel’s Black Box lesson. … a problem with equivalent fractions in algebra. Or, does squaring the top and the bottom of a fraction not do the trick? … a mysterious claim made from a sort of geometric scatterplot question that I’ve never seen before. Come comment and join the fun! At the one-year anniversary of this site, it’s time to take stock. To my mind, the biggest success of this project is the work that I did with exponents. And when I’ve angsted about the future of the site to other teachers, the thing that they’ve tried to tell me is that the sort of large-scale, synthetic analysis is what they value the most. The problem is that this sort of big analysis is difficult. I don’t know how to reproduce it on anything like a consistent basis. 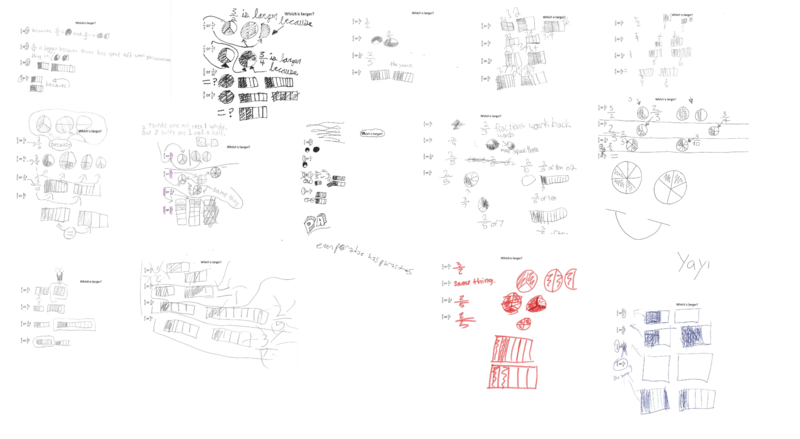 More and more, though, I’m wondering if I just need to dive into it more consistently. If I make a project of closely analyzing mistakes, maybe I can find patterns and trends that will tie some of these things together. If things go well, maybe I can inspire some of you to take the helm of the blog to expand on your own theories and ideas. For what it’s worth, I think that this sort of deep, synthetic analysis of trends in student work can be especially powerful for teachers. In particular, the exponents work wasn’t just interesting, but it was fruitful — a lot of good lesson ideas emerged out of that analysis. Ultimately, I think that those lesson ideas are what most of us are chasing. For the rest of the summer, you can expect new mistakes to be posted sporadically, at best. Instead, you can expect at least one blog post of deep analysis a week. This is just a note to make something official that I’ve been doing unofficially for a few weeks. I’m now posting 3 mistakes a week instead of 5. I think that’s more keeping with people’s ability to process this stuff and comment intelligently. Bonus: it gives me a bit more time, a bit less pressure. Think this is the wrong move? Let it rip in the comments. Thanks all for all your help and support and things. We here at MathMistakes are ready for vacation. Unfortunately, our school doesn’t have vacation this week. (I know!) But yours’ does. We’ll be back next week. Or later this week if someone sends me a really juicy piece of student work.